Bread…scares me. It seems like a whole nother level of “cook.” You’ve got to really know what you’re doing, and you have to plan ahead…starters, and rising times…. I’ve had some forays with the bread machine, but the bread is always dry and pasty. A husband who loves homemade bread as much as life itself plus an MIL and SIL who make the best bread ON EARTH equals: one insecure, scared-of-bread-making wife. If you have the Birmingham Junior League, Tables of Content, it’s on page 135 (how many times do I have to tell you to BUY IT!). It’s called “Rosemary Olive Bread,” but I hate olives and substituted olives for different kinds of cheeses on my first attempt. However, all the spices were too pungent without the olives–so now, I just dump cheese all over the bread instead. MUCH more delicious and MUCH easier. Ingredients: 3/4 cup of warm milk (100 to 110 degrees), 1 Tbl sugar, 1 envelope dry yeast, 1/2 cup extra-virgin olive oil, 2 1/2 cups all-purpose flour, 1 1/4 tsp salt, several heaping handfuls of the cheese of your choice, 1 Tbl yellow cornmeal, 1 egg, 1 Tbl milk, 1/2 tsp coarse sea salt. 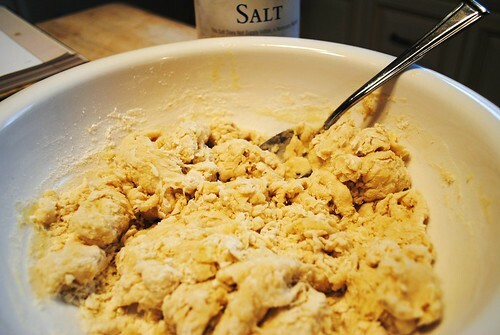 Knead the dough on a lightly floured surface for 5 minutes or until smooth and elastic. 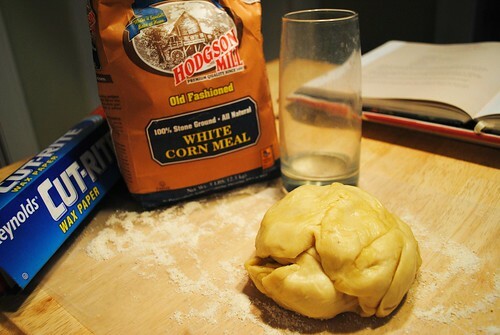 Add enough of the remaining 1/4 cup of flour, 1 Tbl at a time, to prevent the dough from sticking to your hands. The dough will feel tacky. (Ok, maybe I’m still alright. 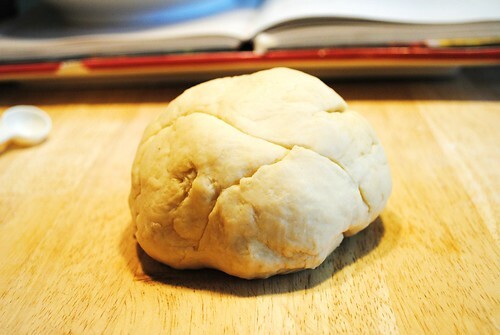 This looks like a ball of dough from TV, right?) Coat a large bowl with 1 Tbl of the remaining olive oil. Place the dough in the oiled bowl, turning to coat the surface. Let rise, covered, in a warm place (85 degrees) free from drafts for 1 hr or until doubled in bulk. (I turned my oven on 350 and left my bread sitting on top like so. I also tried it just sitting over there with no oven on. Both times, it didn’t rise even one lil’ bit!) 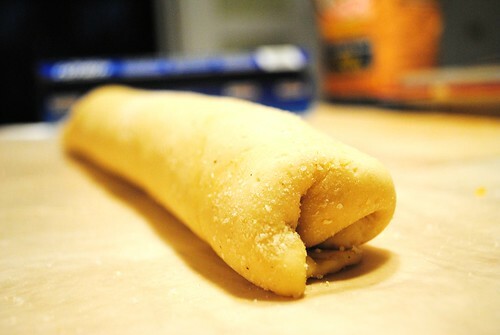 Gently press 2 fingers into the dough. If the indentation remains, the dough has risen enough. Punch the dough down (as though it’s rising uncontrollably and I have to get violent with it to make it stop) and let rest, covered, for five minutes. 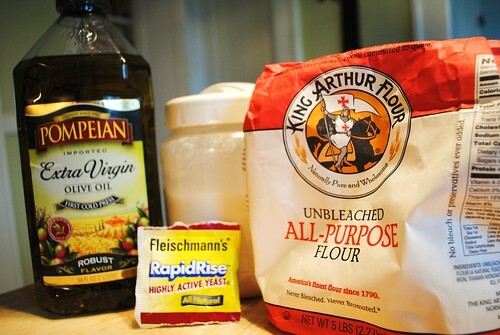 Sprinkle a sheet of baking parchment with the cornmeal. 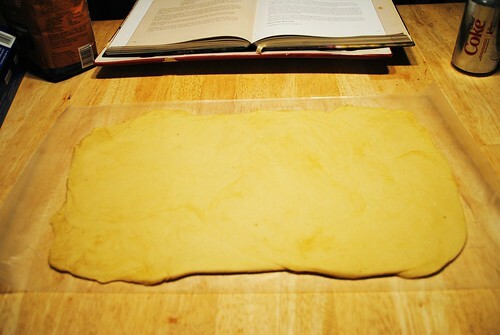 Roll the dough into a 9×13-inch rectangle on the baking parchment with the cornmeal (Note here that I use wax paper instead of parchment, and my “rolling pin” doubles as glass. Such a chef!) If you use wax paper like me, try to transfer the finished loaf off of it before you bake it. 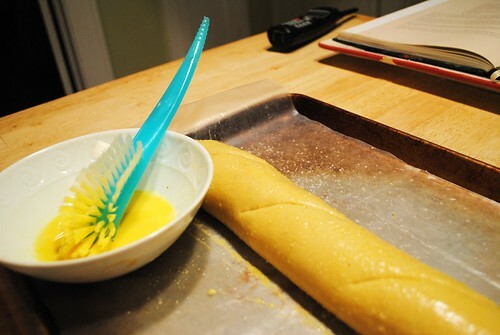 It will come out unscathed if you forget, but your home will smell like melting plastic instead of baking bread. And let’s face it, you don’t need anything else to discourage you at this point. 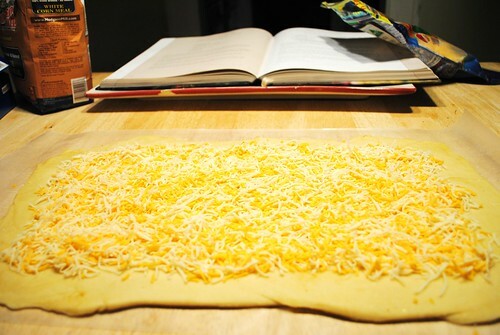 Choose your cheese: And sprinkle evenly over the dough, leaving a 1/2 in border on all sides. Starting with the long side, roll jelly-roll fashion (as though I know what that is), pressing the edge to seal and tucking the ends under. Place the baking parchment (but not wax paper!) and bread loaf, seam side down on a baking sheet. Let rise, covered, for 1 hr or until doubled in bulk…Don’t hold your breath. It didn’t rise this time either. Preheat the oven to 425. Whisk the egg and milk in a bowl until blended and brush over the loaf (Do you like that the only brush I could find to spread with, was my old bottle cleaning brush? Such a chef!). Sprinkle with coarse sea salt. Make three 1/4 inch deep diagonal cuts across the top of the loaf using a sharp knife. Bake for 25 minutes or until golden brown and the loaf sounds hollow when lightly tapped. Remove to a wire rack to cool. OR slice into it immediately because your mouth is watering and you can’t wait to taste your homemade bread with the yummy gooey cheese running out. Call your husband to the table and place it before him with a dramatic flair…and watch him gobble it up without even realizing that you failed miserably, because is still tastes DELICIOUS! Seriously… you are hilarious. I guess the bottle brush is better than the dish scrubbing brush with nasty old food on it! It looks good whether it "worked" or not. I have had NO LUCK with yeast ever. I think it has to do with the temp of the water or something that I'm apparently not doing right! Yeah, I think you got it RIGHT!!!! At least by appearances – I could almost smell and taste it through my computer screen! I don't bake anything unless it's from a mix – MAYBE from scratch if yeast is not involved, it scares me too! Keep working at it – hopefully you'll get some good comments with suggestions that will help us ALL!!! YUM! Looks good to me. So, I am scared of making bread too, but only if kneading is invovled. Steph led me to this great recipe last year that is a no-knead bread and it really is FABULOUS. 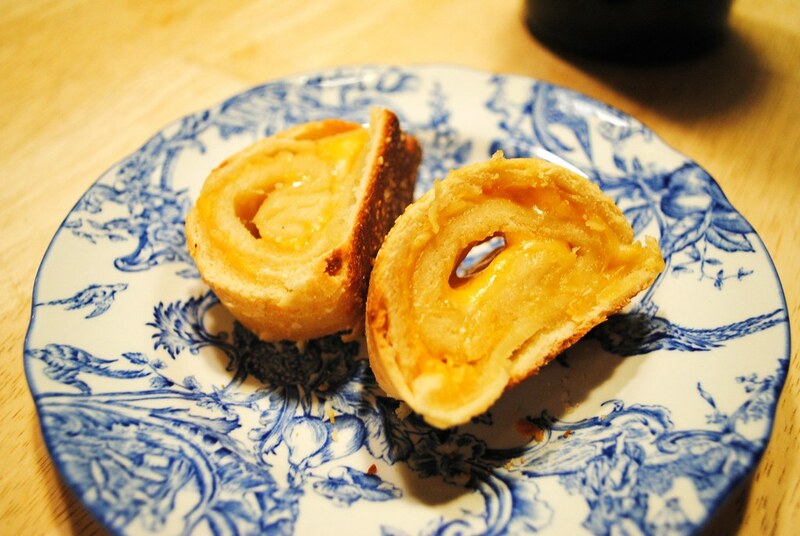 It's a Posie recipe, but I copied it on my blog, so I'll copy both links. 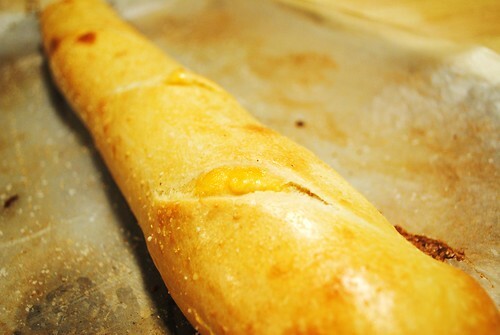 Check out how pretty my bread is, and I barely tried! 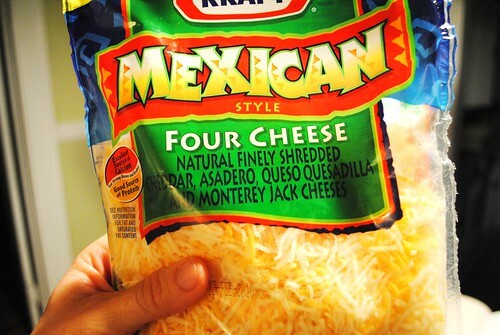 Try it…it's super quick and way yummy. YUMMMMMM!!! I love recipes that work even when my end doesn't! However, yours looked awesome!!!! Two suggestions for rising your bread. Both have been successful for me. 1) take a dutch oven and fill in 1/3 with steaming hot water and put your bowl in it. Refresh as needed. 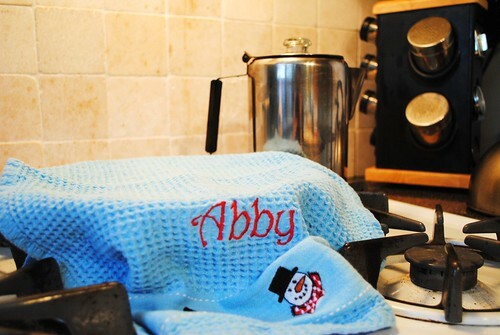 2) heat your oven to 350 degrees and then turn it off. Put your bread in it with the door open and then five minutes later close the door. Happy bread making. It can be fun. You don't know me but I have lived in Dothan for five years and ran across your blog.